The desserts on our Thanksgiving table are assorted and not always that traditional. We make them in abundance. Though Thanksgiving attendance has ranged from twelve to thirty over the years, we like to make sure that there’s at least one dessert for every two to three people–way, way too many. There’s the Frozen Chocolate Marquise with Mocha Cream, essentially a log of cold chocolate mousse. It’s rich, refreshing, and irresistible. My little sister Kate makes it, though I had to step in one year when she was studying abroad in Turkey. Then there’s the Pound Cake. At times, it has played host to a lemon glaze, but at the moment, we serve it plain. It’s the cake from The Silver Palate, and in my mind it’s the best pound cake there is–it’s simply sugar, butter, eggs, and flour, and it’s beaten for a long, long time. Still, not much of it gets eaten after dinner on Thanksgiving. I for one never really want something remotely bread-like after a dinner that includes both stuffing and braided biscuits. Of course that’s not really why we make the pound cake. The whole point of it is to have toasted leftover pound cake to eat the next day. For some years, we made a bread pudding with chocolate chips in it, but that was discontinued. It was just too heavy in the end. Aunt Cindy usually brings plates of brownies and cookies. So those go out. And then we move to more traditional fare. There’s a pecan pie, which really no one eats but me. Pecan pie is my absolute favorite, and I will not give it up. 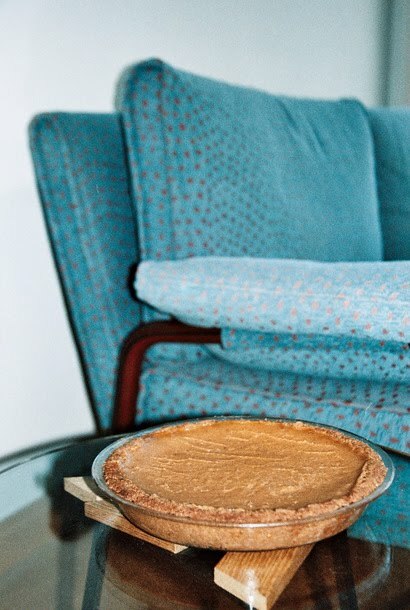 Some years, we’ve made pumpkin pie, but even when it’s there, it doesn’t feel like a tradition–I don’t think I even tried pumpkin pie until I was about 16. Last but not least, there’s my mom’s apple pie, which we all know and love, and which I hope doesn’t get completely eaten on Thanksgiving. I never have room for it after the chocolate marquise and the pecan pie, but I like to eat a slice next to my pound cake the following morning. I suppose in the end, Mom’s recipe makes what you’d call an apple tart. There’s certainly no top crust (that’s really not our style), and there aren’t layers upon layers of apples, which get gluey and soggy–also not our style. In our pie, you get firm, sweet apples and a cookie-like tart dough simply covered in a layer of jam. I have yet to meet someone who didn’t love this tart. Best of all, it’s as suited to be dessert during any of the fall months–no need to limit it to Thanksgiving. But you should add it to your Thanksgiving menu as soon as you can, whether you’re feeding forty people or two. I’ve never spent much time concentrating on which type of apple is the best to bake. Use what you like or what you have. In the past, my mom has made pear pies and mixed pear-apple pies, and I recommend those as well. Preheat the oven to 350°F. Combine the orange juice, sugar, and cornstarch in a large bowl and mix. Add the apple slices and toss to distribute the liquid evenly among them. Roll out the dough and drape it over a tart pan with removable bottom. Press it in, and double the sides of the tart with extra dough. Use a fork to prick holes in the bottom of the pie shell. Brush the bottom with the jam. Arrange the apples in overlapping concentric circles, starting at the outside. You want to squeeze them in, as they shrink during baking. When you get to the center, you may have to lose the circle pattern, but just try to make the apples look attractive. Discard any remaining juice/cornstarch mixture. Combine the flour, salt, and sugar in a food processor. Add the butter and pulse just until the mixture looks like crumbs. Add about 2 tablespoons of the water and pulse again. Continue adding water just until the dough comes together into a ball. Flatten the ball into a disk and wrap in plastic wrap. Refrigerate at least 1 hour before rolling out. What a beautiful, tempting apple dessert. My apple tart features a thin custard cream base under the apples, but now I’m tempted to move to a glaze on top instead. Thanks for sharing the family dessert traditions. Apple Tart with Custard sounds wonderful! Beautiful apple tart. Would love to have the recipe with the custard from SeattleDee too. Yum! I bet it would be soo good with a pear or pear/apple combo, too. It is! I hear you’re cooking all of Thanksgiving this year. Can’t wait to hear how it goes! It looks really good, although I have to say the best dish at our table is Watergate Salad which can also be used as a dessert. It has pistachio pudding, fruit cocktail,nuts, pineapple, and marshmallows. Our Thanksgiving is always a time of fellowship and fun. Happy Thanksgiving to you and yours. Wow. That is the most gorgeous looking apple pie I have ever seen. I must admit, I’m a bit intimidated! Thank you–but no need to be intimidated. Its charm is in its rustic-ness anyway. I cannot wait. 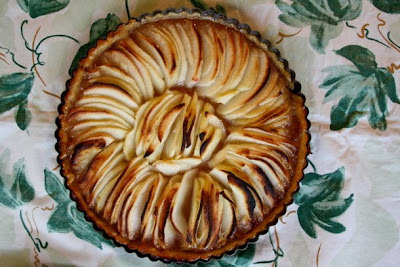 I have 3 lbs of Arkansas pecans and I’m dreaming this apple tart. See you Wednesday for cooking! That is gorgeous! I’d be thankful for a slice of that pie but it’s so pretty I’d hate to cut into it. The tart looks absolutely adorable! Thanks for sharing the recipe. The photograph reminds me of the old lady who used to stay in the apartment above mine in Paris..she used to make beautiful pear and apple tarts. this apple tart looks amazing! Hi! Quick question about the recipe: When you say “combine the sugar, orange juice and cornstarch and add the apple slices and toss to distribute the liquid evenly among them…,” can you please just clarify what that means? Wouldn’t the apples sink to the bottom of the tart pan causing the sugar and juice to overflow? Does everything rise and come closer to the top when in the oven? I’m worried when I take my tart out of the oven, I’ll have a flat tart! Thanks so much! I’m looking forward to making this for Thanksgiving! Hi Ms Cook–you toss the apples with everything in the bowl. Then you transfer the apples one by one into the tart pan, leaving much of the juice in the bowl. When you bake it up, it doesn’t really rise – it’s a tart…it’s supposed to be flat! This apple pie looks great! What size tart pan? –thanks!